Every year as January approaches, parents of college-aged children scramble to gather the necessary information to complete their FAFSA forms (Free Application for Federal Student Aid). This annual ritual can be stressful for your clients. They hear from others that they should submit the application as soon as possible to get the most aid, but unfortunately, the tax data they need isn’t always available! After all, how many of us have our tax returns done by January 1? 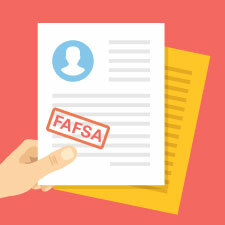 As a result, in previous years, applicants were forced to wait to file or to file unofficial numbers and update their FAFSA forms once their tax return was filed. Thankfully, the process is getting easier starting in the 2017–2018 school year. To help your clients maximize their financial aid, it’s important to familiarize yourself with the process, including recent changes to the FAFSA for 2017–2018, which involve the time frame for filing and the tax year data that is needed. The FAFSA is the government application for federal student aid. The purpose of the application is to determine the estimated family contribution (EFC). To do this, the application requires data on the student’s and parents’ assets and income to determine how much each can afford to contribute to the cost of education. The aid package can include federal Pell grants, federal student loans, and work study programs. Further, many colleges and private organizations use the FAFSA to determine the aid they will also provide. When evaluating an applicant’s assets and income, the FAFSA uses a sliding scale based on geographic location and family size. Certain assets are not counted, such as your client’s primary residence, retirement accounts, annuities, and cash value of any life insurance. The bullet points below show the formulas that are used to determine the EFC. College savings 529 accounts are also counted more favorably as a parent asset—between 2.6 percent and 5.6 percent—rather than at the higher rate of 20 percent under a student asset. There are two major changes to the FAFSA for 2017–2018 that your clients should be aware of. Filing date. One major change is the filing start date. Rather than beginning on January 1, filing can now start on October 1; in turn, the filing period now ends on June 30. So, this year, all FAFSA forms can be filed October 1, 2016, for the school year starting July 1, 2017. By choosing to file at this earlier date, you clients will have the ability to review their financial aid packages earlier and better plan for their upcoming out-of-pocket expenses. Keep in mind that many schools and states may have additional aid application deadlines that may not have changed; therefore, be sure to inform your clients that they should always check with their school or state websites for additional aid applications. Tax data. The second major change is the tax filing year data that your clients will need to provide. Since the filing date has been moved up three months, the tax filing year data should be that of the prior year. No longer will applicants have to “guesstimate” their upcoming taxes and update later. With the October 1, 2016, filing date, clients can use their 2015 tax numbers. Even those taxpayers who have filed an extension will have their returns done by then. Overall, these changes should take some of the stress off applicants and allow parents and independent students to more easily submit their applications. The chart below summarizes these upcoming changes. As the cost for college continues to rise and student loan debt soars (currently exceeds $1 trillion), understanding and maximizing financial aid have never been more important. By understanding these changes and educating your clients, you will help ease their data-collection activities and, hopefully, provide them with more time to budget for these expenses. Do you include the financial aid process as part of your education planning discussions? Do your clients look to you for help with filing the FAFSA? Please share your thoughts with us below.